It was there I beheld a fair maid. “Who are you, my fairest of creatures? My dwelling place is down in Dunmore. So it’s come with me now, I pray, darling. And to venture my fortunes with you? And I stole the fair Rose of Dunmore. In the notes to his Ballads and Songs of the Shanty-Boy, Rickaby points out several “parent” songs that served as models for songs made up by lumbermen. One such parent song is “The Lass of Dunmore.” Rickaby cites it as the model for “The Banks of the Little Eau Pleine” which was authored by Wausau, Wisconsin timber cruiser W.N. “Billy” Allen about the drowning of a raftsman in the Wisconsin Dells. Rickaby made the connection based on a version of the text of “The Lass of Dunmore” printed by Minnesota singer Mike Dean in his songster The Flying Cloud. No melody was ever collected from Dean for “The Lass of Dunmore” but the text does resemble that of the “Little Eau Pleine” and it turns out that the only other version of “The Lass of Dunmore” I know of was collected in Allen’s home province of New Brunswick in the 1960s. Amazingly, it shares its melody with versions of “Little Eau Pleine” collected by Rickaby from both Dean and Ed Springstad of Bemidji. 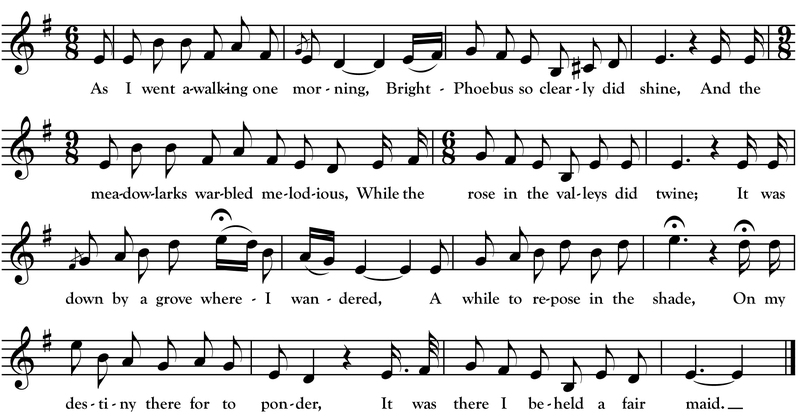 Here I have married Dean’s text for “The Lass of Dunmore” with his melody used for “The Banks of the Little Auplaine” as recorded by Robert Winslow Gordon in 1924 from Dean’s singing.